This one above is yet another flower that we saw on the hiking trail next to where we live. I didn’t realize that there was a bug on the plant until I opened the file at home. Do you see it? 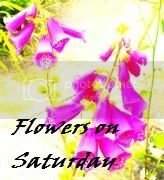 Please head on over to Ewa’s blog, Blueberry Craft and Hobby Time, for more pretty flowers. Scavenger Hunt Sunday | Something Vintage, etc. Scavenger Hunt Sunday | The 5 Senses, etc. Scavenger Hunt Sunday |Side Lighting, Etc.